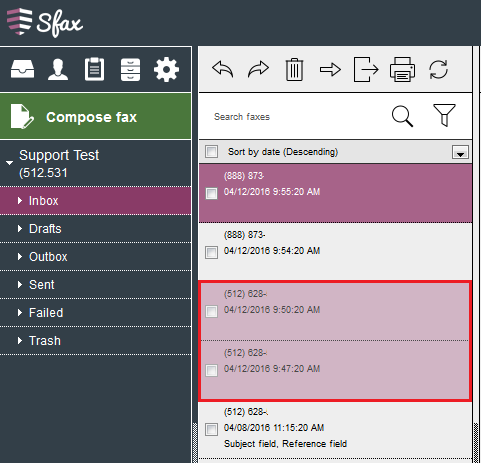 If you see a fax highlighted in pink in your inbox this is to indicate that there was a fax attempted to your line but was unable to complete. This can be caused by communication errors between the fax connection, early disconnects from the sending party, or cancellation of a fax from the sending party after transmission began. In some cases you may only see part of the fax or you may encounter an error that the fax was unable to be rendered. We would suggest contacting the sender and asking them to resend the fax or in some cases you may see the fax in your inbox as the sending party may have already resent the failed fax. If you continue to experience this issue and unable to receive from the sending party please submit a support ticket for further assistance.